If you want to be part of this awesome project, please see Team/Vacancies for all the info. Sorry there won't be DAB+. There is no feasible license possible for our purpose as it would costs over 1000 EUR. We feel this money has much better purposes in the overall event. We will be broadcasting from 3rd to 9th of August 2017. Please note changes on this schedule are not updated in real time, use the refresh button inside the calendar (below +319a) to refresh. Do not refresh your browser, it's useless. If you want to add a show please contact PsychiC on psychic@sha2017.org or DECT 2PSY (2779) as this scheduler thinks breaks while looking at it. Please don't try use/fix the schedule as I've already had to recreate the whole damn thing twice now. 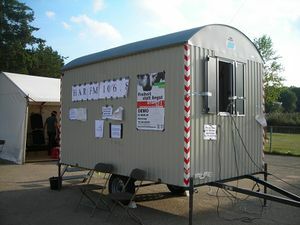 Provide up-to-date information about the event to the visitors on camp and the rest of the world. Provide an addition of the event and discussions about our current (digital) age. Provide a platform where anyone can speak up to share their thoughts and knowledge. Honor our heritage regarding the freedom of speech on the air and the wire. And of course to have lots of fun. In 2009 under lead of Brenno de Winter we erected HARFM to follow-up SubUrban from W!T!H! in 2005. 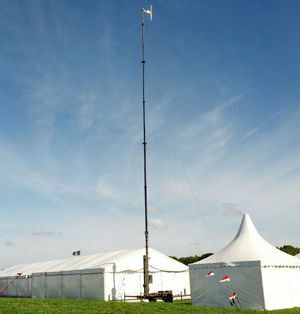 Our goal was to build a radio setup along with an actual FM transmitter and provide content before and during the event. As soon as our FM license allowed us we started broadcasting and didn't finish until our licensed airtime was over. After that static remained.... at least until the following year in 2010 when we did a stream-only version on ETH0 Summer. This was the first time we've been using the common name BinaryVoice as leading name for the hacker radio concept. In 2011 BinaryVoice went international by invading CCC by bringing our concept within HX2 as the primary stream and FM station on camp. 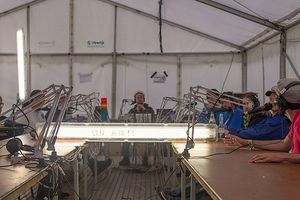 The next big hacker event in 2013 we were present again, this time under the alias "OHMroep" , which is a play on the dutch word "omroep" meaning broadcasting station. 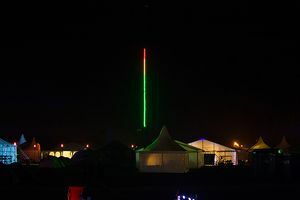 Although we had one of the biggest setup to show for, once again on FM and digital, but we were held back by OHMwoes. Now, 2017, SHA will happen and BinaryVoice will be there again. Under Team:Productiehuis we can share knowledge, resources and funding giving us the power to achieve awesomeness. Volunteers are what drives the community and this project is completely from and for the community. The more people joining the teams, the better content we can produce and the better experience everyone will get out of this project. BinaryVoice strives to be an open team where anyone can contribute to the community by literally speaking up. We reach thousands of people on each event making your voice heard. Whether it's news, debates, discussions, controversy, interviews or simply having fun, we have made the platform for it to happen. Anyone can participate despite age (why not a show by kids for kids) or skill and we have never ever said no to anyone who wants to participate. If you would like to join this project, let us know by sending us an e-mail to psychic [at] sha2017 [dot] org or drop by on IRC channel #sha2017-productiehuis. We are looking forward talking to you ! This page was last modified on 7 August 2017, at 17:53.